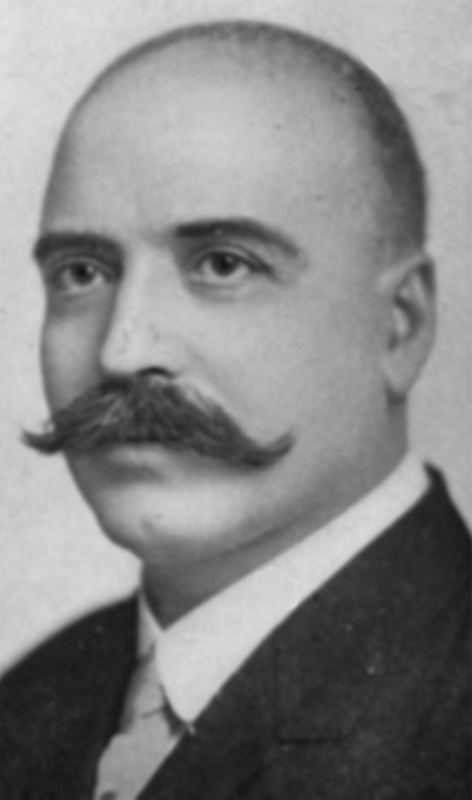 John Loyal Morrison, publisher of The Duluth Rip-saw from 1917 to 1926, was a conservative reformer with a highly sarcastic approach. The Duluth of the period was in the midst of both an iron-mining boom and Prohibition. Red-light districts and speakeasies were commonplace. In Duluth, as elsewhere, such businesses could only function only with the tacit approval of the authorities. In the pages of the Rip-saw, Morrison attacked drinking, gambling, brothels, the city’s moneyed “autocrats,” local and regional political machines, and what he called the “unholy and undesirable alliance” among politicians, law enforcement, and criminals. One of the Rip-saw’s earliest targets was Duluth Police Chief Robert McKercher. 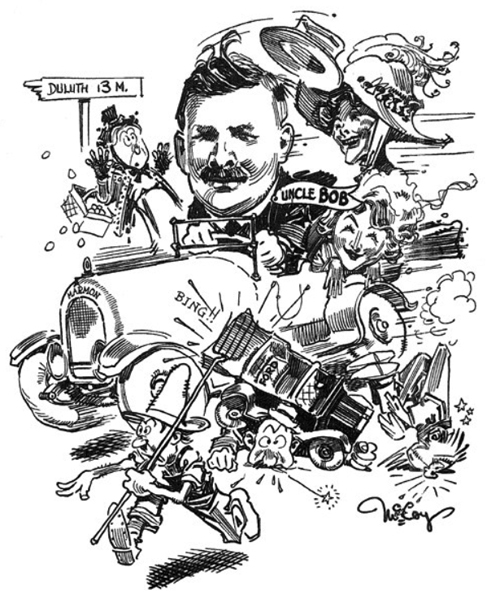 The banner headline of the July 7, 1917 issue informed readers that “FRIENDS FEAR CHIEF M’KERCHER IS GOING BLIND.” In the article, Morrison wondered why McKercher had no trouble seeing such things as the ore docks and his own luxurious automobile (rumored to have been given to him by the owners of the ore docks), but never seemed to notice any of the illegal activities that flourished openly around him. There are redlight ladies galore on the boulevards. Some have complexions vivid enough to see a block away. Some of these dames should wear dimmers, their complexions are so dazzling. But the genial chief can see them not. This looks very, very bad for “Uncle Bob’s” recovery of normal eyesight. His many admirers greatly fear that, before long, they will see the famous snowshoe catcher of hardened criminals seated in his big Marmon car, in front of the Wolvin building, holding a tin cup in his hand, with a placard on the car, bearing these words: PITY THE SORROWS OF A POOR BLIND MAN. After spending the night in jail, Morrison was released and almost immediately re-arrested, this time on a charge of conspiracy to subvert the public morals. Morrison pled not guilty to both charges. The two men who were with him in the hotel room, Emil Swenson and George Hillyer, were not charged with any crime. Morrison commented briefly on the situation in the next Rip-saw, saying that he suspected McKercher was trying to frame him because the police chief was “shivering in his shoes” over the Rip-saw’s exposure of his misdeeds. At the trial, the courtroom was packed with interested spectators. City prosecutor John Samuelson waxed eloquent, calling Morrison “a snake in the grass, one who crawled on the ground, made unfit by the Almighty to walk on his feet.” Chief McKercher was the city’s first witness. During cross-examination, Morrison’s attorney A. E. McManus “created a sensation among the spectators when he suddenly asked, ‘Isn’t it true, Mr. McKercher, that you hired Miss Langdon yourself in an attempt to dispose of Morrison?’” McKercher denied this, replying, “Why, that game is so old, Mac, that it’s got whiskers on it.” Miss Langdon herself could not be questioned, having disappeared shortly after giving her statement to McKercher. The statement, over McManus’s objection, was admitted into evidence. McManus rested the defense’s case without calling Morrison or any other witnesses to the stand. The jury, after deliberating for nineteen hours, declared itself “hopelessly divided” and returned no verdict. A new trial was scheduled for February 13. In the Rip-saw of February 9, Morrison declared himself “yet unhanged,” but said little regarding the case. Instead, he wrote a lengthy piece on brothels that were protected by Chief McKercher, as well as a few more anecdotes about the chief’s sexual indiscretions. On February 11, McKercher dropped all charges against Morrison.